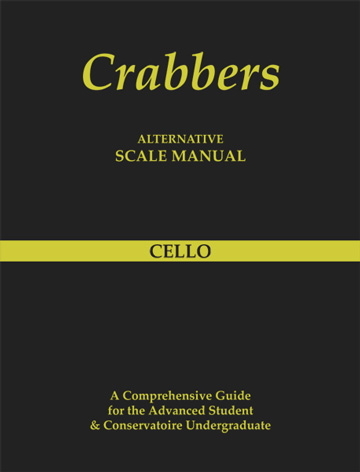 How to quickly understand the Crabbers Scale Manuals. The top line represents the letter names of the scale. Underneath the letters are the numbers which represent the fingers. The comma is the instruction to change string. Example 3,0. Please note if there is no comma do not change string. You will need to change position on the same string before arriving at a comma. The arrow ( ) represents the descending section of the scale. Three octave scales are in compound time (triplets) so the pulse will fall on the signs. 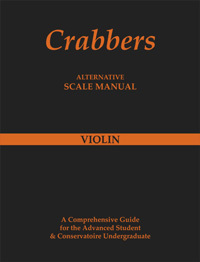 For efficient practise you can begin anywhere within the scale on either a or .This will give the correct pulse, with the correct bowing and with the correct finger. 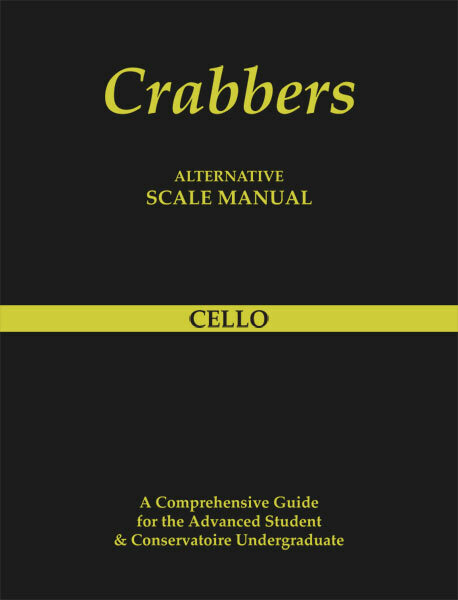 The practicing of thirds is a vital element in attaining an advanced technique on cello. It will improve aural awareness, and will help the student build up strength and flexibility in the left hand fingers. Relaxation of the left thumb is of paramount importance when sliding in and out of an extension. Aim to lead the shifts from your left arm, and only use the minimum amount of necessary finger pressure. Using the same fingers for adjacent chords should give a seamless legato feel to the scale. It is also important to concentrate on achieving a controlled movement from the right arm, wrist and fingers when changing strings. This should result in an even tone and ease of execution. Two examples of how to effectively practise thirds. Also suitable for sixths and octaves. 1. Practice thirds thus: slur the thirds from boxes 1-2 on a down bow, then boxes 2-1 on an up bow. Then boxes 2-3 on a down bow and boxes 3-2 on an up bow etc. While doing this, generate the upward shifts with a small clockwise arm movement and the downward shifts with a small anti-clockwise movement which will pull the fingers. 2. Another practice method is to ghost each part. 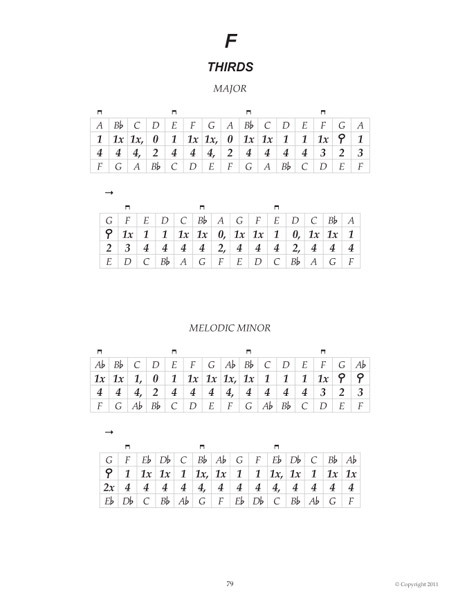 This will improve tone, intonation and fluency and freedom of execution. Ghosting requires the bow to be drawn across only one string at a time. The left hand fingers continue moving together normally. 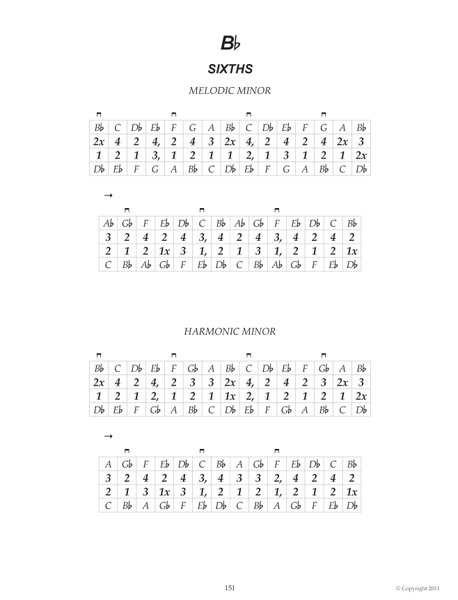 Ghosting will show any inaccuracies in intonation and position changing. This method of practice should be used for all double stop scales. For pure intonation it is crucial that the left hand is relaxed and that a smooth change of position is achieved. This is especially noticeable when using slurred bowing. Examples of how to effectively practise sixths. Also suitable for thirds and octaves. 1. Practise thus: slur the chords from boxes 1-2 on a down bow, then boxes 2-1 on an up bow. Then boxes 2-3 on a down bow and boxes 3-2 on an up bow etc. While doing this, generate the upward shifts with a small clockwise arm movement and the downward shifts with a small anti-clockwise movement which will pull the fingers. 2. Play box 1 on a downbow, then repeat box 1 on an upbow, slurring to box 2. Then slur box 2 to box 3 on a downbow etc. 3 Another practice method is to ghost each part. 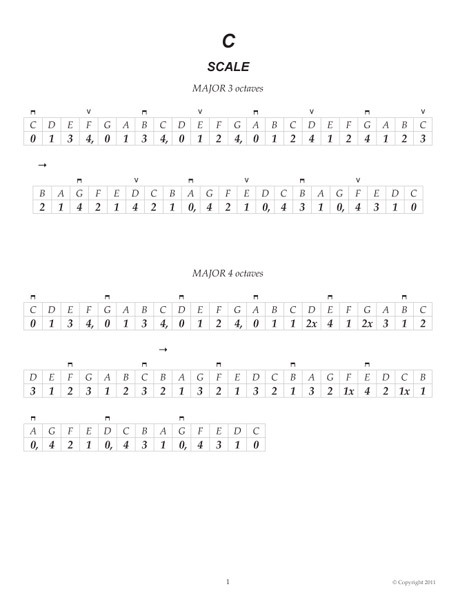 This will improve tone, intonation and fluency and freedom of execution. Ghosting requires the bow to be drawn across only one string at a time. The left hand fingers continue moving together normally. The Crabbers Scale Manual has been designed as an alternative system of learning scales using letters and numbers. Scales presented with this system will offer another dimension for study and may be more readily assimilated through finger patterns and aural perception. Focus on the difficult areas of each scale more efficiently.